A lovely cake to serve on Mother's Day. Makes a beautiful presentation. Have all ingredients at room temperature. Position a rack in the center of an oven and preheat to 350ºF (180ºC). Butter and flour two 9-inch round cake pans. In a large bowl, sift together the flour, baking powder and salt. In the bowl of an electric mixer, beat the butter on high speed until creamy, 4 to 5 minutes. Gradually add 2 cups of the sugar and continue beating, scraping down the sides of the bowl, until light and fluffy, 4 to 5 minutes more. Reduce speed to low. Fold the flour mixture into the butter in three parts, alternating with the milk, until smooth. Fold in 1 tsp. of the vanilla and the coconut extract. In a large, clean bowl, beat 8 of the egg whites with a whisk to stiff peaks. Fold 1/2 cup whites into the batter until blended, then fold in the remaining whites. Divide the batter among the prepared pans. Bake until golden and a toothpick inserted into the centers comes out clean, 30 to 35 minutes. Cool to room temperature. In a heatproof bowl, combine the remaining 2 egg whites, the remaining 1 1/2 cups sugar, the water, cream of tartar and corn syrup. In a bowl set over a pan of simmering water but not touching the water, beat the mixture until thick, shiny and double in volume, about 7 minutes. Remove from heat; add the remaining 1 tsp. vanilla and beat until the icing is thick enough to spread, 2 to 3 minutes more. In a small bowl, combine 1 cup icing and 1 1/2 cups of the coconut; stir to mix. 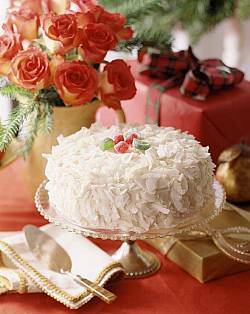 Set 1 cake on a plate, spread the icing evenly over the top and set the other cake on top. Working from top to bottom, spread on the remaining plain icing. Pat the remaining coconut evenly onto the sides and top. I've had this cake at Diana's for my birthday twice (and I traveled from NJ to get it) and it was what dreams are made of. To be able to make it at home is awesome! I've made this recipe and while I had to actually go out and get some of the ingredients it was worth the time and effort it took to make it. I'm not a cook (far from it) but it was not a hard cake to make, and it was delicious. Simply lovely!!! My hubby and I loved it! I MADE THIS CAKE FOR MY DEAREST FRIENDS B-DAY. I HAVE NEVER TASTED SUCH A WONDERFUL CAKE, AND MY FRIEND WAS SO IMPRESSED, WE HAVE SAVORED IT AND WILL MAKE IT OFTEN...THANK YOU!